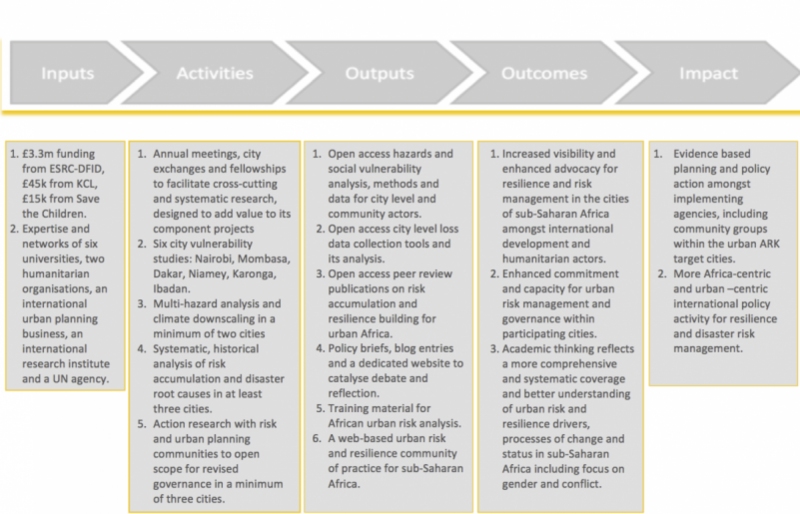 Increased visibility and enhanced advocacy for resilience and risk management in the cities of sub-Saharan Africa amongst international development and humanitarian actors. Enhanced commitment and capacity for urban risk management and governance within participating cities. Academic thinking reflects a more comprehensive and systematic coverage and better understanding of urban risk and resilience drivers, processes of change and status in sub-Saharan Africa including focus on gender and conflict. More Africa-centric and urban–centric international policy and academic landscape for resilience and disaster risk management. The programme encourages wide collaboration – please join the conversation. We invite you to join our planned city science and stakeholder meetings, to apply for our visiting researcher fellowships (see below) and for places in our intensive training workshops and to share your thoughts and reactions through our website and twitter account https://twitter.com/Urban__ARK. Future planning and post-programme legacy are central to Urban ARK. The programme also links to important tools and frameworks for measuring and increasing resilience to multi-hazard impacts developed by various agencies and targeted at multiple scales. For example, Save the Children’s Household Economy Approach - a unique livelihoods-based framework for analysing how people obtain food, non-food goods and services, and how they might respond to changes in their external environment and UN HABITAT’s City Resilience Action Planning (CityRAP) Tool for providing national and local governments with tools for measuring and increasing resilience to multi-hazard impacts. The Urban ARK fellowship scheme aims to facilitate exchange and learning between programme partners. A fellow should be an early career researcher or practitioner, associated with one of the partner institutions and must undertake their fellowship at another partner organisaiton. Preference is given for applicants from sub-Saharan Africa, but none are excluded. Each fellow will be sponsored to spend up to two months in an international exchange with one of the consortium partners producing a clearly defined output, such as a co-authored academic paper. Please contact Urban ARK through our Contact page for further information of these fellowships and how to apply.